No more driving to the movie theater! No more waiting in lines for lousy popcorn! With your Home Theater you will be in charge. Schedule family movie nights and create the memories that last a lifetime. Home Theater with Natural Audio – Skilled Contractors make the difference. We’ve been installing the highest quality Home Theaters for over a decade. Throughout this time we’ve seen it all. Large or small, our team is dedicated to create the most attractive, functional and amazing media experience possible. To make this a reality our design and installation team are comprised of skilled trades people that have decades of experience in home remodeling and general contracting. This means you can rest assured that our design and construction meets the absolute highest level of quality and craftsmanship. Call our office today to book your in-house consultation. We think you’ll be pleasantly surprised at what is possible! 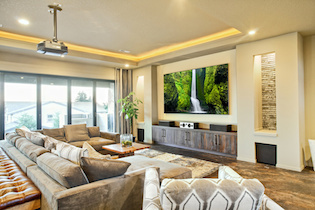 Adding a home theater is a great addition to your home that can add value and help create lasting family moments. Whether you are designing from scratch or converting an existing space, our designers are ready to help. Here at Natural Audio our experienced team uses the highest quality components to ensure your Theater delivers the ultimate in cinematic experience. It’s time to get that complete theater experience in your home! Incredible picture, amazing sound quality to share with friends and family! Call today! Let’s see what’s possible for you!